Sustainable Cycles, in partnership with girls’ empowerment organization, Full Circles Foundation (FCF), has been selected as one of 6 projects to receive a $1,000 Fellowship though SustainUS, a youth environmentalist organization! The Fellowships were awarded to 6 small-scale sustainable development projects all over the United States. 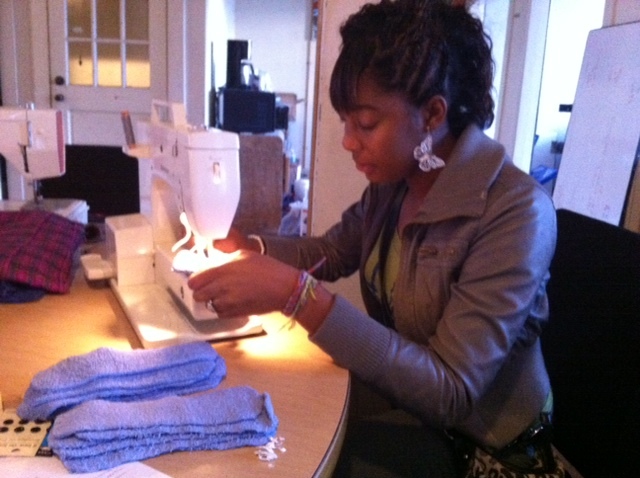 For the year 2013, Sustainable Cycles will partner with FCF campers Tyra Davis and Aniah Bland. They will receive mentoring and support for their project, and get to know the other fellows though conference calls and in-person meetings. We will be working on creating educator’s packets, and organizing a cross country bike trip to come (more on that later). We’d also like to begin writing posts about some of the international public health work going on regarding access to affordable, sustainable menstrual products. In Raleigh, Toni, Aniah, and Tyra are developing a line of reusable cloth menstrual pads to sell as a microventure to support FCF. So far, SC has focused on menstrual cups – we are excited to branch out. The awesome thing about pads is that we (or anyone!) can make them ourselves without any fancy equipment, and have a low-cost, sustainable product. Until now, all Sustainable Cycles’ funds have come from grassroots fundraising and small donations, or out of Sarah and Toni’s pockets. We can’t wait to step up our game in 2013! Campers from Full Circles Foundation (represented by Tyra Davis, Aniah Bland, and Toni Craige), will partner with Sustainable Cycles (represented by Sarah Konner and Toni Craige). The FCF girls will learn to make reusable cloth menstrual pads to sell as a fundraiser for FCF, and they will create “educators’ packets” on the what, why and how of sustainable menstrual products. Sustainable Cycles will distribute the packets to community educators all over the country. Sustainable Cycles is also planning and promoting an upcoming cross-country bicycle tour to raise awareness. Conventional products are expensive and wasteful: The average woman in the US will spend about $2000 over her lifetime on single-use, disposable menstrual products. Conventional disposable products are made of trees, bleach, cotton, and glue (none of which are great things to put inside your body). After one use they are thrown away. The average woman throws away a huge truckload of menstrual products over her lifetime. Very few people know about the alternatives: A very small proportion of US women use sustainable alternatives (menstrual cups, sea sponges, reusable cloth pads). It is not lucrative business to sell these products (they are inexpensive, and you do not need to replace them often). Our culture of silence about women’s bodies and menstruation stops people from even talking about the issue. There is limited access to sustainable products in communities that most need them: Menstrual products are a significant financial burden on low-income women. They often do not have access to information about alternatives, or the up-front cost of the alternatives is prohibitive. Income source for FCF girls and programming: This project could eventually provide fair and empowering employment for FCF girls. FCF has a long-term vision of having youth-owned cooperative businesses all over the Southeastern United States. Sparking a grassroots movement, reaching out to new communities, empowering community educators: We hope that the hands-on experience of making the pads and educator’s packets will get FCF girls fired-up about these issues. FCF works primarily with low-income women of color – a community which does not tend to have a lot of access to sustainable products. The girls will have the tools and enthusiasm needed to spark a grassroots change in their communities. Sustainable Cycles will reach out to our large national network of supporters to put the educator’s packets in action all over the country. Announcing Our Summer 2013 Cross-Country Bicycle Tour! I LOVE these products and think that what Sarah and Toni are doing is revolutionary, especially when Woman’s rights are being challenged more than ever. I would like to support the cause, though, I am in a tight financial position right now, as I’m sure many women are. I would like to know how I can contribute in a way I can afford. I have bought The Diva Cups for myself and my friends to continue the cycle (so to speak). Hi! Thanks for your enthusiasm. We are working on making educators packets so that people like you can give awesome workshops in their communities about sustainable products. I think the best thing that you can do is tell everyone you know (regardless of age or gender) about this. Do you know ANY woman that does not already use sustainable products? Encourage your friends who do use them to tell their friends. Send an email linking to our blog. Encourage your friends to do it too. Give an informal workshop (contact us if you want help doing this). Post on Facebook. Etc! You rock! Congratulations on the Fellowship, great work! I have not heard of FCF before but am thankful to be introduced. Thanks and best of luck! Thanks Andrew! FCF is at fullcirclesfoundation.org I’ll be co-directing our camp for girls this summer. Hope to see you soon! Toni – Congratulations on keeping this effort moving!